The human microbiome is a significant commercial opportunity for the life sciences sector. Scientific studies have clearly shown the role of the microbiome in the pathogenesis of many mainstream diseases. Microbiome-based drugs and diagnostics are being studied in a wide range of disorders, including cancers, gastrointestinal or gut conditions, Crohn’s disease and colitis, dental problems, and chronic infections. Exploiting the human microbiome could help fill gaps in the conventional treatment options for disease. Rare or orphan diseases that are not currently addressed by pharmaceutical companies are another area of emphasis worldwide. 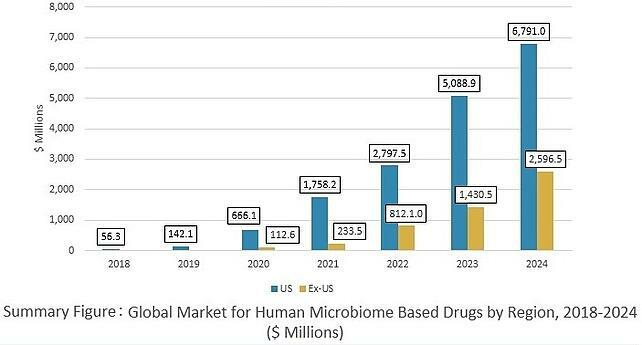 According to a recent forecast by BCC Research, the global market for human microbiome-based drugs and diagnostics will reach nearly $9.9 billion in 2024. Microbiome-based drugs are expected to comprise approximately 95% of this market, with $9.3 billion in sales in 2024. The size of the microbiome diagnostics market is predicted to be $506.3 million in 2024. Growth of the market from 2018 through 2020 is expected to be modest. However, market growth will gain significant momentum with the launch of a number of microbiome-based drugs in 2021 and 2022. Gastrointestinal disease is estimated to account for 35% of the microbiome market and cancer for 13%. The microbial population in a patient’s gut may predict how they will respond to treatment for Crohn’s disease and other inflammatory bowel diseases (IBDs). A research team from Massachusetts General Hospital (MGH), the Broad Institute of MIT, and Harvard University concluded there were commonalities in the microbiomes of people with IBD for whom antibody-based treatments were successful. Their findings were published last month in Cell Host & Microbe. Prior research has found that gut microorganisms play a role in various immune system disorders. Therefore, Ananthakrishnan’s team sought to discover if the gut microbiome could predict which patients would respond to specific therapies. The researchers studied 85 people with IBD (43 had ulcerative colitis and 42 had Crohn’s disease). The patients were all given the monoclonal antibody vedolizumab. The researchers used patients’ stool samples to study the composition and function of each patient’s gut microbiome. After analysis, it was found that patients who had more diverse microbial populations prior to treatment were more likely to meet the criteria for remission of IBD symptoms after 14 weeks. A diverse gut microbiome means there is a greater likelihood of potentially anti-inflammatory microorganisms. The microbial changes observed after 14 weeks in patients who achieved remission persisted for at least a year, meaning these early changes can help predict who will respond positively and maintain that response. Researchers are similarly aiming to use microbiome profiling to predict response to cancer immunotherapy. The team has preliminary evidence suggesting that gut microbiome differences in a small group of patients with melanoma predicted who would respond to checkpoint blockade immunotherapy. Jennifer Wargo, a researcher at the University of Texas MD Anderson Cancer Center, described the work at the American Society of Clinical Oncology annual meeting last week. She and her colleagues set out to compare the composition and diversity of microbes in the mouth and gut in 233 individuals with metastatic melanoma treated with checkpoint blockade immunotherapy (most often with treatment targeting PD-1). After collecting oral and stool samples from the study participants, the group assessed gut microbe members in the mouth and gut. The researchers also profiled molecular features in the individuals’ tumors, along with their immune cell repertoire. The investigators saw signs that patients responding to anti–PD-1 treatment tended to have higher microbial diversity in the gut, although oral microbiome diversity was comparable between responders and nonresponders. The team also saw differences in representation by specific types of bugs in the gut that seemed to coincide with response or lack of response to the anti–PD-1 treatment. Some bacteria were found at enhanced levels in responders, Wargo said, including those from the Clostridiales order. Other microbes, such as bacteria from the Bacteroidales order, turned up more frequently in nonresponder gut microbiomes. The researchers’ subsequent experiments suggested that checkpoint blockade response tends to be marked by more robust immune infiltration of tumors, enhanced CD8+ T-cell density, and other immune profile differences. Wargo reported that there seemed to be some microbes that were more common in the gut when these response-related immune features were present in the patients with metastatic melanoma. The human microbiome–based drugs and diagnostics sector is set to develop and grow, primarily driven by three factors: (1) proof-of-concept data from a wide range of microbiome projects in multiple diseases with substantial unmet needs, (2) increasing collaboration activity between industry and academia to generate data on existing and new therapeutic targets, and (3) continued investment by both private and public sector players. As is the case for many emerging technologies, microbiome-based companies and medical treatments will have to navigate regulatory controls and other developments. Frameworks, such as clinical trial standards, protections for intellectual property, and ownership rules, will develop both nationally and worldwide. And, definitions are still evolving for different bacteria—some are live, whereas others are engineered—as well as the rules for donors and recipients of bacteria or small molecules. The human microbiome–based drugs and diagnostics market represents a multibillion-dollar opportunity. Small start-up companies spearheading the development of this sector are expected to further build on their collaborations with big pharmaceutical companies that have the capabilities and commercial infrastructure to build on the science and transform it into real business.